CNN speaks with Fareed and former New York Mayor Rudy Giuliani about the apparent softening in Iran’s rhetoric under new President Hassan Rouhani. This is an edited version of the transcript. What do you think of the changes going on in Iran? Clearly it seems like President Hassan Rouhani is certainly a lot different at least in tone than Ahmadinejad? Giuliani: No question, the tone is completely different. The question is, is this credible or is this just a way of buying time so they can continue to either enrich uranium or maybe even stop that for a while. Do you think it's credible? Giuliani: I begin by being very skeptical because of the history, because they played us for a fool before, Rouhani actually even bragging about it. I have to look at that history and say, there’s a really good chance they’re doing it again. At the same time, you can go ahead and talk to them and you can go ahead and try to test this out and see is there a change. But the main thing is you better be ready not to make any concessions until they deliver the goods. I would want to make sure there was a verification program in place. That we actually began the verification program and knew they were going to let us go inspect these facilities. Then when we got to that point we felt they were really delivering, we could start talking about reducing the sanctions. Because I do think this is not a function of whatever happened in Syria, I think this is a function of the sanctions. Fareed, with Rouhani, do you believe there is a real difference? Do you believe this is a significant change? Zakaria: Look, I think these are very promising signs. You have to test it. They have in the past had a strategy of talking and not delivering. Here’s what’s different this time. Rouhani campaigned on this idea of being able to make a deal with the West so that he could ease the sanctions. Clearly the sanctions are what are behind this and they feel the pain. There are the makings of a deal. You want to test it and make it step by step. You don’t want to make the concessions before they allow the inspections. What gives me some hope is that Rouhani, unlike Ahmadinejad, is an insider. He’s known the Supreme Leader since 1980. He has worked within this establishment. He’s a cleric. 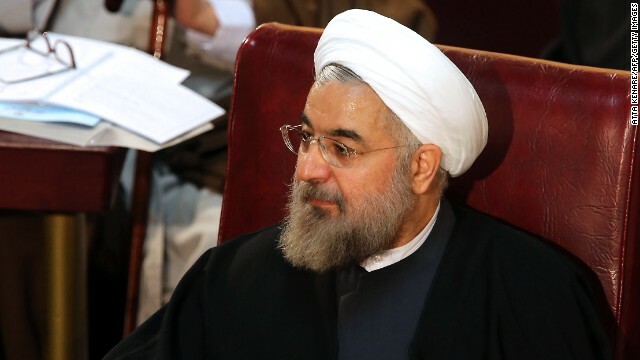 Rouhani continues to say, though, that Iran has no nuclear weapons program. Should that concern us he was saying that or just talk? Giuliani: Assad was saying that until a day before he agreed at all, to allow inspections of the chemical facilities. I think Fareed is correct in the sense that Rouhani is putting out different signals than in the past. I even think being a skeptic that this is a little different than it was six or seven years ago. I don't think this is to buy time to just increase uranium and enrich it more. I think they're actually at a point where they're only a year away any way. I think they are going to halt the program. I think what they are trying to do is get relief from the sanctions and then when the economy starts to come back again then we have to worry that they are going to go back and start enriching uranium again. So the key to me here is I think it is pretty simple that the administration can be tough and not drink the Kool-Aid. I think if we say, all right, you want relief from the sanctions, we want to inspect all your facilities and then allow those inspections to take place for five, six, seven months and make sure they're not doing what they did five, six years ago, throw the inspectors out and make sure we have not only a change of words but change of action. Should President Obama meet with Rouhani this week? You would say secretary of state, meet with him? Giuliani: I think Fareed is right. I come from the old school of the president walks in when the deal is done and blesses it. All the hard work is done before the president is there. You don't put your president in a position of having somebody walk out on him, having it backfire. And if something goes wrong you don’t want the president blamed for it. Get all the details worked out. The main thing I would be concerned about in watching this is let’s not give away anything until we have a verification program in place and we’re actually executing it and our inspectors are confident that they’re being given the access they were previously denied. « Previous entryIs Japan really back? I cannot believe some of these comments. They have to be from some serious racist individuals that really have a hard-on for the president, trying to place the blame on him for everything. I guess the recent flooding in Colorado, the mass shootings in Washington and Kenya are the presidents fault to...And on the subject of Iran, the new president can show a gesture of goodwill by releasing the two Americans being held captive in his prison. Anybody that believes Obama claim in his Speech at the UN that the World is a better place since he took Office, where the Middle East Policy is a complete Disaster. America is weakened because Iraq is having massive Terrorism through out the country, Afghanistan where the Taliban, and Osama Bin-Ladin who was the Architect of Al-Qaeda has spread all over the World attacking the US at Ft. Hood by one of our own which Obama is in denial, Al-Qaeda is being supplied by Obama in Syria, Lebanon is controlled by Hezbollah linked to Iran, and Syria while Russia has Check-Mated Obama playing Power Broker, Supplier of Military Hardware, and Technology for these Rogue Regimes to fight Proxy Wars with Western-Europe, US, and Israel, and playing the Peace-Maker in the process, while Iran is blowing smoke up Obama's #@*%$, and Obama is not only buying in to these moves that even Dictator Assad of Syria is also playing Obama, while Obama, and Clinton did major damage to the relationship that the US, Israel, and Egypt has enjoyed for over 30 years by supporting the Al-Qaeda Wing of the Muslim Brotherhood's Morsi, while spitting in the Eyes of the Egyptian Military who kept the Government in Egypt Secular that was reinforced with the Fiasco of Muslim Brotherhood linked Al-Qaeda Attack in Bengahzi that Obama, and Clinton can try to run from, but can't hide from like Lois Lerner, and the IRS, and now Al-Qaeda has executed a massive Attack on Obama's Native Land of Kenya, where he spent a good part of his Childhood. Yeah...Obama is great, and Obama has made the World safer like Iran, and North Korea building Nukes because they know that America has a Patsy, Obama who is clearly in over his Head, not to mention the Health Care Law he signed, and changed it to favor Big Business, and Congress completely exempted from Obama-Care, while We The People have already spoken as Senator Ted Cruz of Texas is trying to speak for We The People who said enough is enough....De-Fund Obama-Care, and let Hateful Harry, and his Dictatorship, Obama who said, "I am not going to talk or negotiate with the Republicans, but I do want to talk to Iran, and Russia." You are certainly miss named of course it was your choice. Why are you spending so much time bad mouthing Obama when you have no replacement for the policies he is implementing? Obama's native land is Kenya? Then I suppose my native land is Holland and I have never been there! You should get with the anti-Hillary crowd, she needs the free publicity. The best thin that has happened lately for the Democrats is the Tea Party. It is fun watching the Republicans destroy each other. OMG it is just like high school all over again. American's are very naive in the belief that we are the worlds hero. Our media is tainted. I wouldn't let small children act the way governments do. So the next logical question is... If they are not doing what we elected them to do why are we letting them continue to do it. Well put, mirageseekr. Thank you. Lets hope he didn't take this from someone else's post somewhere in the internet land and its actually his own view. Judging from the quality of his argument I would think it is. Now how does someone who was a lowly mayor imagine he is qualified to provide advice on foreign policy to a second term President? 2. The aspiration: As earlier observed, Belichick appreciates the right way to put his prices in situation to become successful . and infrequently because of outsidethebox thinking. Nonetheless Tebow is actually unwavering in his want to become an NFL quarterback. How's he going to consider it when his new manager says, 'Look, we'd like you at limited close and Hback. Disregard the quarterback things.' If this kind of request came and Tebow stiffarmed it, he is likely to be portrayed with a few international descriptors: malcontent, ingrate or mefirst participant.